Experience the wild, rugged beauty, rolling sand dunes and wildlife of Namibia before travelling down to the beautiful Cape. Your journey starts at the airport where your guide will meet you. You will enjoy lunch on the road before arriving at the lodge. Dinner will be had at the lodge. 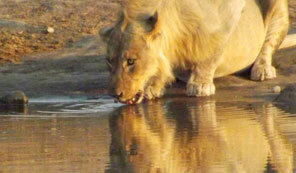 We continue northwards into the Etosha National Park, arriving at our lodge in time for lunch. 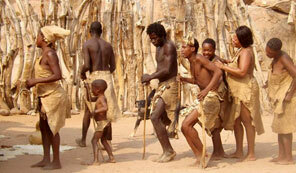 We will stop over at a Himba village at Otjikandero, which was built to demonstrate how they live. Lunch will be enjoyed on the road, at a restaurant or at Uis, before continuing towards the coast. We have dinner at one of Swakopmund's many fine restaurants. We will overnight at a hotel / guesthouse. After enjoying breakfast at the lodge, we depart in the direction of Aus. Lunch will be had en route before continuing on to Lüderitz passing by the Garub wild horses. Lüderitz is a quaint, harbour town, known for its German colonial architecture. We will have dinner at the hotel. After breakfast, we depart back in the direction Aus stopping at the Kolmanskop, the famous ghost town which lies abandoned in the sands of the Namib. It grew out of a diamond rush in the early 1900s, but was later abandoned when the diamond-field was exhausted. We have lunch en route and arrive at our lodge near the Fish River Canyon. This spectacular natural phenomenon hides out of sight on the flat dry plateau until you are almost upon it. 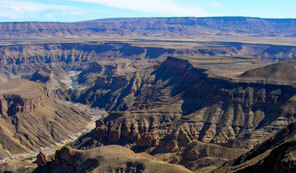 The canyon is believed to be the second largest in the world, after the Grand Canyon. Its enormous gorge meanders along for a distance of about 160 kilometres. It is up to 550m deep in parts and up to 27km wide. We have dinner at the lodge. We rise early to enjoy the sunrise over the canyon before returning to the lodge for breakfast. We then depart in the direction of Grunau, before continuing to the South African border at Noordoewer. Lunch will be had en-route. We arrive at Springbok and check into our Lodge. Dinner will be enjoyed at the Lodge. After breakfast we continue south. At the right time of year (August to September), this area is covered in a stunning blanket of wildflowers. If we are able, we will visit this beautiful spectacle. Lunch will be had en-route. We arrive in Cape Town in the afternoon. We stay in the Protea Hotel at the Cape Town Waterfront. After breakfast at the hotel, we will embark on a tour of Cape Town. This includes Simon's Town, the Cape of Good Hope, Table Mountain and a visit to the wine route for some wine tasting. Lunch not included. Dinner will be enjoyed at the hotel. Breakfast will be at the hotel and then you are free to do some shopping, depending on the time of your flight back home. End of service - we wish you a warm return back home!